Oregon’s underlying economy is more volatile than the typical state. We do worse in downturns (larger job losses, higher unemployment, higher populations in need of assistance) but we also do better in expansions. The good news is that the economy spends a lot more years in expansion than it does in recession and on net, Oregon comes out ahead of the typical state over an extended period. The 2000s are somewhat of an exception given that the decade was book-ended by recessions that hit Oregon harder than most places given our concentration in high-tech manufacturing and the housing bubble. Nevertheless, Oregon today is growing significantly faster than the typical state and making up lost ground. We’ve closed about 2/3rds of the employment gap between Oregon and the typical state, and not quite half of the poverty rate gap, although we’re making progress there as well. Today the Census Bureau released a new report on Supplemental Nutrition Assistance Program (SNAP) use for 2013. As has been the case for quite some time now, Oregon ranks really high in terms of the program’s use. While SNAP usage is certainly a measure of the state of the economy and the size of the population in need of assistance, it’s also subject to administrative/bureaucratic/governmental policy decisions that impact eligibility or redetermination of benefits and the like. Our office (Mark) chairs a DHS/OHA forecast oversight committee and in discussions with our counterparts in those agencies, this is certainly something that has come up. For lack of better words and these are my words, Oregon is successful in not only enrolling eligible individuals in SNAP but also keeping them enrolled while eligible. This may or may not be the case in other states. One big potential issue is administrative/paperwork issues that can make it more or less challenging for individuals to stay enrolled in the program. E.g. throw up a bunch of administrative hurdles and participation in the program can fall. 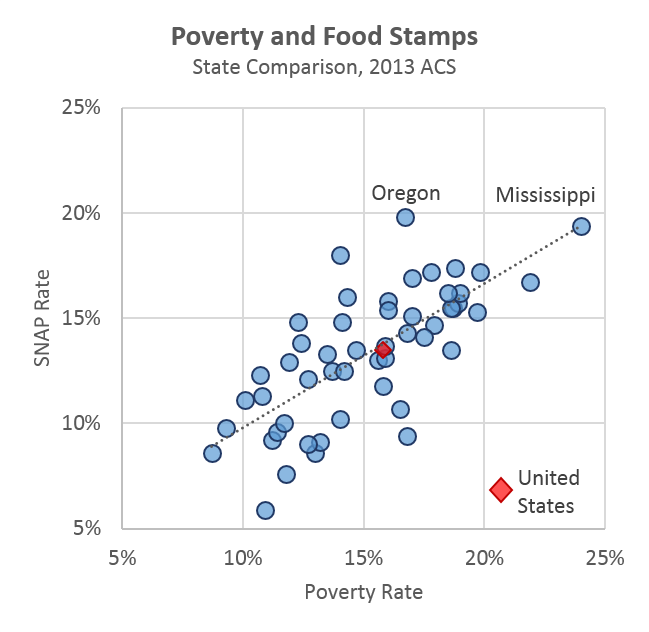 I cannot confirm this occurs elsewhere, however one easy comparison I like to make is the relationship between the poverty rate and the SNAP rate. It’s clear that Oregon is an outlier. While the state is tied with Mississippi for the highest SNAP usage rate, Oregon has the 19th highest poverty rate. The other states with similar poverty rates as Oregon (16-17%) have an average SNAP rate of just 13.9 percent compared with Oregon’s 19.8 percent. 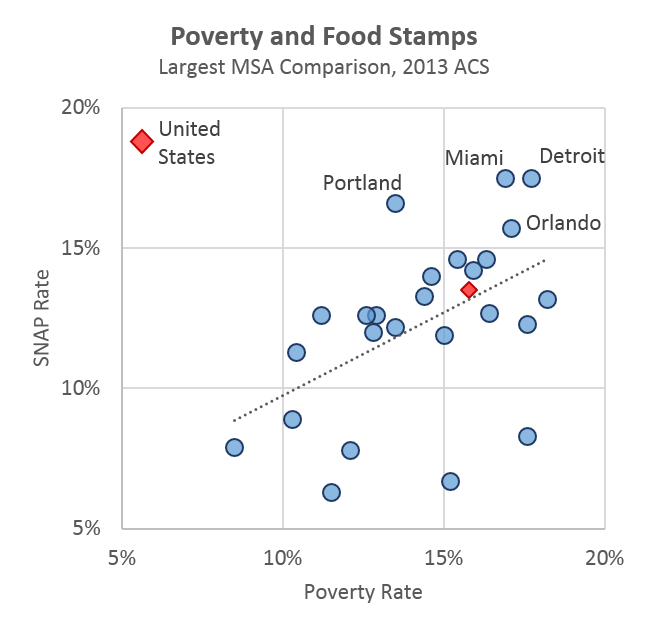 Portland is in a similar situation relative to the other largest metros in the country. While it is certainly harder to say what the optimal level of benefits should be in the bigger picture, Oregon does appear to be successful at providing SNAP benefits to those in need. Overall there should be a clear relationship between poverty and SNAP given the broad eligibility requirements, and there is. However with subsets of the population and various ifs and ors in the specifics of eligibility across states and the administrative requirements of participants, differences do materialize. According to USDA, SNAP benefits in FY 2014 were $1,161,871,005 in Oregon. That’s alot of money injected into Oregon’s economy that is spent in our economy, right? How does it compare with other entities that bring dollars into Oregon’s economy? That certainly is a lot of money. From the state’s perspective, the administrative costs are low as well. Additionally, the fact that this money is going to those in need also indicates they’ll spend it.